TrumpWatch, Day 385: Government Shuts Down Again — Will It Reopen on Friday? 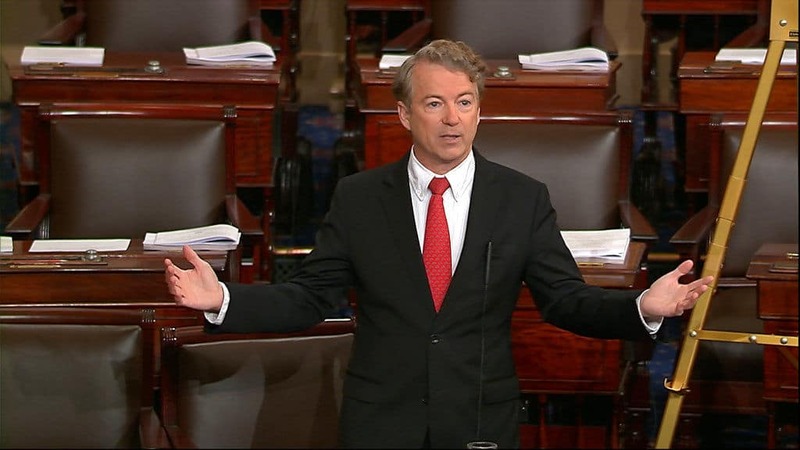 The Federal Government shuts down again, as a filibuster by Senator Rand Paul of Kentucky (pictured) holds up passage of a spending deal. The Senate was scheduled to approve the deal, sending it to the House for confirmation, before supplemental funding expired at Thursday. However, Paul held the floor for hours to prevent a vote. Paul is one of a number of conservative Republican legislators — who could still affect the deal in the House of Representatives — who object to the raising of the Government debt ceiling, necessary to permit the allocation of an extra $300 billion over two years to the military and domestic programs. The measure authorizes another six weeks of supplemental funding, in the hopes that a budget can finally be agreed by late March. The Senate is hoping to give final approval early Friday, with the House to follow, possibly before the start of the workday on Friday. A fifth round of supplemental funding is necessary because the Trump Administration has not presented a final budget for approval after more than a year in office. To get around the lack of a budget, Senate GOP and Democrat leaders announced the agreement on Wednesday to assured funding for the military until 2019, as well as extra money for infrastructure, the opioid crisis and mental health, child care,veterans hospitals and clinics, and disaster relief in response to last year’s hurricanes and wildfires. Critics noted that Paul’s fiscal conservatism did not stop him voting for December’s $1.5 trillion tax cut pushed by Republicans through Congress, even though the measure will contributed to an estimated $1.1 trillion Federal Government deficit by 2019. In the House of Representatives, conservative Republicans could be joined in opposition to the deal by Democrats concerned that no provision has been made for the status of almost 800,000 young undocumented “Dreamer” immigrants, threatened with deportation from March 5 when the Trump Administration ends the Deferred Action for Childhood Arrivals program. House Minority Leader Nancy Pelosi, who held the House floor for eight hours on Wednesday to express the concerns, told a closed-door meeting of House Democrats last night that they will have leverage if they demand a debate on immigration legislation. However, she said she will not stand in the way of lawmakers who wish to support the spending deal without setting a condition over the Dreamers. Pelosi and the two other highest-ranking House Democrats sent a letter to Speaker Paul Ryan, pressing him to make a public statement about the scheduling of an immigration vote. Environmental Protection Agency head Scott Pruitt, defying all scientific evidence and projections, suggests climate change can help humans. Is it an existential threat? Is it something that is unsustainable, or what kind of effect or harm is this going to have? I mean, we know that humans have most flourished during times of what? Warming trends. The scientific consensus is that climate change is “proceeding at a rate unprecedented over decades to millennia”. Long-term effects include a steady increase in global temperatures, more droughts and heatwaves, stronger and more intense hurricanes, and rising sea levels. Public health in the US can be affected by disruptions of physical, biological, and ecological systems. Health effects of these disruptions include increased respiratory and cardiovascular disease, injuries and premature deaths related to extreme weather events, changes in the prevalence and geographical distribution of food- and waterborne illnesses and other infectious diseases, and threats to mental health. Pruett is a former Oklahoma Attorney General who regularly pursued cases against the EPA. As head of the agency, he has overseen cutbacks in climate change research and the deletion of the term from EPA memoranda and websites.